"Native barrister told to get out of office"
An article published in The Friend reports on Duma Nokwe being denied access to chambers in His Majesty's Building, and the Bar Council's decision to take up the matter with the Minister of Native Affairs. "Mr Philemon Pearce Duma Nokwe, who only four months ago became the first Native in the Transvaal to be called to the bar, has been told that he cannot take up chambers in His Majesty's Building in terms of the Group Areas Act and the Native Urban Areas Act. "A spokesman of the Bar Council told me today that representations would be made to the Minister of Native Affairs. "This is a matter which affects all advocates in the practice of their professions," he said. "A letter to Mr Nokwe, signed by the Native Commissioner, Mr FJ Cronje, said that Mr Nokwe's application for accommodation in His Majesty's Building could not 'be favourably entertained as it is contrary to policy'. "This decision is regarded as a victory for a small group of less than 20 among the 160 advocates whose chambers are in His Majesty's building. "I understand that more than 140 barristers were prepared to accept Mr Nokwe as a colleague, but that the minority has kept up a constant stream of complaints about the consequences. 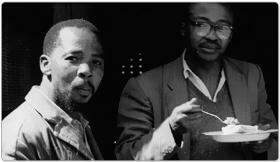 "It seems particularly ironic that the Minister's decision coincides with an article and photographs in the latest overseas State Information Office bulletin in which Mr Nokwe is held up as a shining example of the progress being made by Natives - where it is stated, anyone with ability can become a professional man."